HAMPDEN, Maine (AP) — A Maine police detective was fatally injured on Interstate 95 Wednesday when a wheel came loose from a logging truck and struck him as he was attending to a disabled vehicle, state officials said. 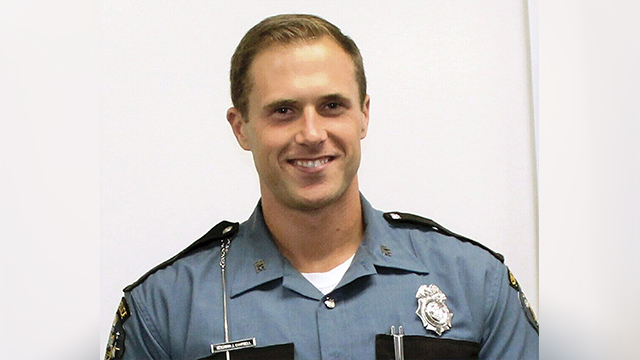 Detective Benjamin Campbell, 31, was out of his vehicle Wednesday morning when two wheels separated from the truck, which was driving past, Maine State Police said. Campbell, who had been a member of the Maine State Police for about seven years, was in the breakdown lane when he was struck by one of the wheels, while the other rolled away, said Maine State Police Chief John Cote. Cote described Campbell as the victim of “bizarre timing” and said aspects of a police investigation are still ongoing. Campbell had been on his way to instruct a training session when the wheels dislodged just after 7:30 a.m. Wednesday in Hampden, near Bangor. Campbell died at Eastern Maine Medical Center in Bangor, police said. The driver of the truck was Scott Willett of Patten, who is the owner and operator of Scott Willett Trucking, Cote said. Willett stopped driving when the wheel came loose, he said. Willett will be subject to normal protocols of a fatal crash investigation, such as a blood test to determine if alcohol was a factor, Cote said. Gov. Janet Mills directed flags to half-staff statewide for the remainder of the day. She says the state is “heartbroken” over the loss of Campbell.